One of the most interesting day hikes in Wilderness State Park and certainly the driest is this loop that combines Nebo Trail, Old South Boundary Trail and the trail known as Swamp Line Road with several short nature trails. The entire hike is an 8.35-mile day but it is well marked and there is little elevation gain, making it an easier trek that most hikers accomplish in three to five hours. Some wet sections can be encountered along Old South Boundary Trail in the spring and after a heavy rainfall but the mud is rarely impassable. You are in low-lying wet areas so insect repellent is a must in May, June and early July. Along Nebo Trail is a three-sided shelter that makes a great place for an extended break or lunch if the timing is right and Nebo Cabin, a classic log structure that can be reserved in advance. With a night in the cabin, you can turn the loop into an easy weekend backpacking trip with a 2-mile hike the first day and a 6.3-mile hike back to the trailhead the second day. The description below begins at Nebo Trailhead along Wilderness Park Drive. If staying at the campgrounds it would be easier to begin the loop at post No. 1 near Pines Campground. That would reduce the hike to 7.95 miles. 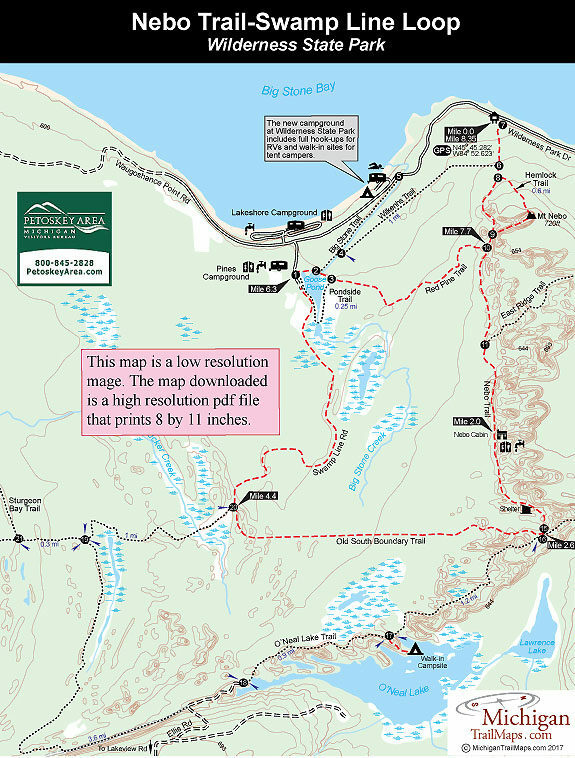 Most of the route is open to mountain bikes with the exception being Red Pine and Hemlock Trails. At post No. 1 off-road cyclists would bypass Red Pine Trail and finish the loop by following Wilderness Park Drive 1.7 miles back to the Nebo Trailhead for a 8-mile ride. The trailhead for the Nebo Trail is well posted along Wilderness Park Drive and located 1.5 miles east of the park office. Within the parking area is post No. 7 and a gate across the trail. Nebo Trail, like many trails in Wilderness State Park, is a two-track built by the Civilian Conservation Corps in the 1930s to access projects in other sections of the park. Within a quarter mile is the first of two junctions to the Hemlock Trail. This 0.6-mile spur leads to a steady but short ascent to the top of 720-foot Mt. Nebo. The “peak” is marked by a set of large stone blocks, the remains of a fire tower that the CCC built and used until 1949. If enough leaves have fallen, you can catch a glimpse of the Straits of Mackinac. Nebo Trail continues in the rolling woods and at Mile 2 passes Nebo Cabin. This snug, little structure was also built by the CCC on a pine-covered knoll overlooking the trail. Outside are a vault toilet and drinking water, inside five bunks, a table and a wood-burning stove. The log cabin, a wonderful place to spend an evening or two, should be reserved in advance (800-447-2757; www.midnrreservations.com). Less than a half mile further south is a gate across the trail and a three-side shelter. The log shelter is another CCC project and features a massive stone fireplace and two picnic tables. It sits on top of a small rise overlooking the trail. The shelter followed by posts No. 15 and No. 16 at the south end of the Nebo Trail, reached at Mile 2.6. Post No. 16 marks the junction of the O’Neal Lake Trail to the south and Old South Boundary Road to the west (right-hand fork). Head west along Old South Boundary Trail which at one time did mark the southern boundary of the state park. The trail is a straight two-track that between Mile 3 and Mile 4 passes through the a marsh area where mostly there will be frogs jumping everywhere. Towards the end the trail swings northwest and arrives at post No. 20, marking its junction with Swamp Line road and Sturgeon Bay Trail. Head north (right) on Swamp Line Trail, another two-track that within a mile passes an open patch of water surrounded by marsh. Just before the entrance to Pines Campground you reach post No. 1 at Mile 6.3, a major trailhead in the park. From this point there are several ways to return to the Nebo Trailhead including following Big Stone Creek, the park road and Wilkenhs Trail. The most scenic route, however, is Red Pine Trail picked up at post No. 3 after skirting the north end of Goose Pond. For a full description of Red Pine Trail and the route back to the Nebo Trailhead, reached at Mile 8.35, see Red Pine-Big Stone Trails Loop. The park has 250 modern sites divided among two campgrounds. The Lakeshore Campground is situated along Big Stone Bay in a semi-open area and among the 150 sites is a row right off the beach. Pines Campground is across Wilderness Park Drive and has 100 sites, most of them with paved pads and situated in a grove of mature pines. Both campgrounds tend to be filled weekends from early July to mid-August but usually have sites available midweek throughout the summer. The exception is the last week of August through Labor Day when the park is filled daily due to the Mackinac Bridge Walk. Wilderness also has six rustic cabins scattered throughout the park with three of the trailside cabins situated on the Straits of Mackinac and a short walk from Wilderness Park Drive. Cap's Cabin and Waugoshance Cabin sleep eight each, while Station Point Cabin, an old log structure with wooden floors, has four bunks. Sturgeon Cabin, a short walk from the end of Sturgeon Bay Road, and Nebo Cabin sleep five. All cabins are well used and should be reserved far in advance. The day-use area is located just east of the campgrounds on Big Stone Bay and includes tables, vault toilets and a wide stretch of sandy beach. The park also has an improved boat launch located just west of Lakeshore Campground. There is a vehicle entry fee at Wilderness State Park. The park’s two walk-in campsites are $12 a night and its six rustic cabins, including Nebo, are $60 a night. The park also has 250 modern campsites in two that are $16 to $27 per night. Cabins and campsites can be reserved online (www.midnrreservations.com) or by phone (800-447-2757). The park’s backcountry campsites are reserved through the park office. Wilderness State Park is 8 miles west of Mackinaw City and is reached by following County Road 81 and continuing west on Wilderness Park Drive after crossing Carp Lake River. The Nebo Trailhead is 1.5 miles east of the park office on Wilderness Park Drive. There is also an entrance and parking lot at the south end of Sturgeon Bay off Lakeview Road, reached from US-31 by turning west on Gill Road 4 miles south of I-75. 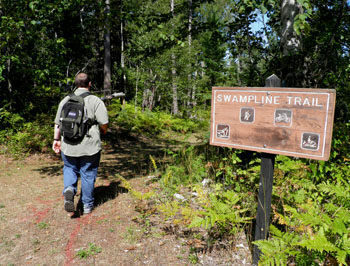 Contact Wilderness State Park (231-436-5381) for information on trail conditions or to reserve the walk-in campsites. For lodging or other travel information contact the Petoskey Area Visitors Bureau (231-348-2755, 800-845-2828; www.petoskeyarea.com).